“Susannah” – Carlisle Floyd’s powerful, moving story of a beautiful Tennessee girl who innocently falls into a scandal and faces ostracism in her small mountain town, ironically named “New Hope Valley” – is the Spring feature presented by Reinhardt University Opera, March 15-17. Lead character, “Susannah,” is a role that will be shared by senior Brianna Perez and junior Victoria Hill, and directed by Dr. Cory Schantz with musical direction by Brian Osborne. While the original opera was written in the 1950s, Perez finds its themes to parallel with topics today’s audience can find relatable. “It’s been the greatest artistic challenge of my life. I’ve grown so much, and it’s made me feel even more strongly about the ability of performance to connect with an audience,” Perez said. Playing the role of “Olin Blitch,” Dylan Cronan said this character has been one of the most difficult characters he has ever portrayed. 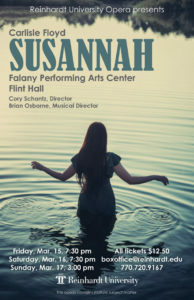 “Susannah” will run March 15 and 16 at 7:30 p.m. and March 17 at 3 p.m. at the Falany Performing Arts Center. Hill will play the role of “Susannah” March 15 and March 17; Perez will perform the role March 16. Tickets are $12.50 and can be purchased by emailing boxoffice@reinhardt.edu or online at Reinhardt.tix.com.